ASK THE EXPERTS: Senior Service Roundtable JOIN US for a Presentation and Senior Resource Info Fair! 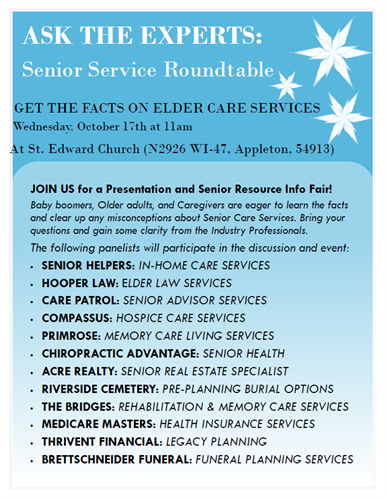 Name: ASK THE EXPERTS: Senior Service Roundtable JOIN US for a Presentation and Senior Resource Info Fair! Get the FACTS on Elder Care Services. Baby boomers, Older adults, and Caregivers are eager to learn the facts and clear up any misconceptions about Senior Care Services. Bring your questions and gain some clarity from the Industry Professionals. getting the facts on elder care services.